In his book "Ma Cuisine" Auguste Escoffier describes a variety of sauces. Together the form the backbone of the modern French-inspired cuisine. There was both basic sauces and derivative sauces. This is an overview of the basic sauces and recipes for them. Reduce the stock to ¼ so you end up with approx. 1 liter (1 quart). Mix the starch in a little bit of cold veal stock. mix it in and cook it along about. 1 minute. Sieve it through your finest sieve. Stir the roux into the stock. Let it simmer for approx. 1 ½ hours. Remove the foam from the sauce regularly. Made like a plain velouté, but with clear light chicken stock instead of veal stock. Made like a plain velouté, but with clear fish stock instead of veal stock. Fish stock will get bitter if it boils too long. Therefore the sauce does should boil / simmer any longer than 20 minutes. The sauce is thickened with egg yolks. Mix everything together, except the butter, and bring it to a boil. Let it reduce to 2/3 on high heat. Stir occasionally so it does not burn. Once it has become so thick that you can make a trail on the back of a spoon, it's finished. Before serving take it off the heat and add 100 g (3½ oz) of cold butter into cubes. It must not be heated up again when the butter has been added. Cook stock and add cream until it is clear white, and taste like you want. 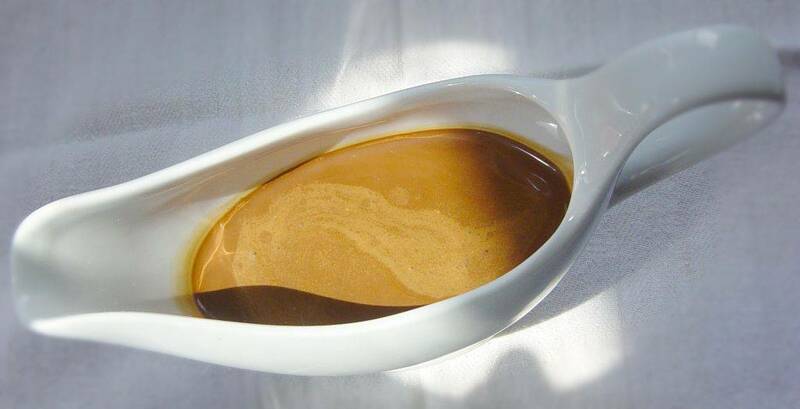 This sauce is often made simply by adding light stock to a béchamel sauce. Bring the stock and mushroom broth to a boil over high heat. Add the cream a little at a time. Save the last dl. Boil it in by 1/3 until approx. 1 liter. Before serving take it off the heat and add the last cup cream and 80 g of butter into cubes. It must not be heated up again when the butter is first added. 5 kg (11 lbs) tomato. Canned Tomato is fine. Melt the butter and brown the bacon lightly in it. Add the ingredients of the mirepoix. When they are browned then add the flour. Add the rest and let it cook for 1 ½ -2 hours.